The Bible is a book about many things, but one of the great themes running from cover to cover is men and women rising to the challenges in life through faith in God. When the test comes, when the difficulty arises, when the obstacle looms in front of you, don’t shy away from the challenge. With God’s help, step into it. One of the most familiar stories in the Bible tells how David, a young Jewish shepherd boy, unexpectedly found himself in battle facing a freakish, nine-foot Philistine warrior named Goliath. You’ve no doubt heard the story somewhere. But what I personally love most about the account is how David approached the fight. The Bible tells us that this teenager, armed only with a sling and a few smooth stones from the brook, “ran quickly toward the battle line to meet him” (1 Samuel 17:48). Moments later David was standing over the fallen giant, praising God for a great victory. He ran to the battle line. Nothing illustrates inviting the challenge better than that. The first place I remember seeing that quote was taped to the mirror in my parents’ bathroom. So you might say that God began teaching me this concept at an early age – even though I didn’t know what it meant at the time. It inspires me to think about how Davis Love III walked into that round of golf at The Players Championship, with the storm all around him, a great challenge before him, and his fellow players grousing about the conditions and cursing their luck. A day of great adversity became a day of unparalleled opportunity. The very circumstances that defeated many others became a tool to push him to one of the greatest victories of his life. It sounds strange, but sometimes setbacks in a golf tournament can actually help to settle a player down and give him or her more focus. We can see that this is true by going back to Zach Johnson’s Sunday round at the Masters. He was in the third group, just two shots back, and in a position to make a move. So what did he achieve on the first hole that morning? “It settled me down,” Zach recalled. And as it turned out, Zach made par on the final hole, won the tournament, and had an Easter Sunday he would remember for the rest of his life. But it doesn’t always work out that way, does it? “Success,” says Zach Johnson, “isn’t always on the scorecard. Winning isn’t always based on numbers or stats or hoisting up a trophy with everyone cheering for you. Yes, it’s a great opportunity when a Christian athlete can give thanks to God and profess his faith after winning a tournament. But what you don’t see are the guys who give glory to God even when they lose. Nobody has a camera in your face when you finish 45th in a tournament. But the guys I’ve looked up to, the guys who have inspired me, are the guys who sign their scorecards – whether on Thursday or Sunday, whether they win or lose – and still are able to give glory to God. That, to me, is a successful day. That is winning. “You may not even have to say anything. It may just be the way you walk, the way you hold your shoulders. There is no set way to glorify the Lord when you’re not winning – but that doesn’t mean you won’t have an opportunity to do so. Sometimes, even when you aren’t successful, you’ll hear another golfer say, ‘I like how you play the game. You always seem to have a peace about you no matter what your scorecard says or what you shot that day.’ That’s the kind of stuff you want to hear. 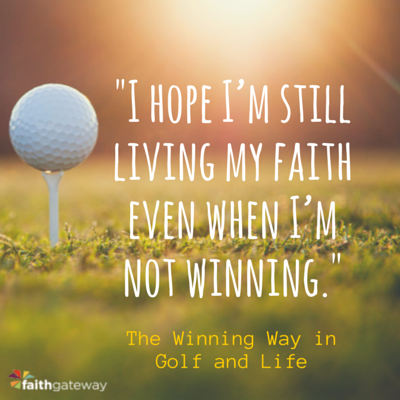 Excerpted with permission from The Winning Way in Golf and Life by Morris Pickens, copyright Dr. Morris Pickens. Dr. Morris Pickens (or Dr. Mo as his students call him), is the Sports Psychologist and Performance Specialist at the Sea Island Golf Learning Center. He has been a coach to some of the best golfers in the world. His students have won over 200 amateur titles, 30 professional tournaments, three major golf championships, and one NCAA Championship. He and his wife have four children.